Understanding and navigating the Team Administration section is now a breeze. We’re no longer showing all your information and configuration on one long page. Now you’ll have a clear list of administration pages you can access, which are listed on the left-hand side of your administration pages. We’ve modernized the style of Team Administration pages to both be less bland and to be more consistent and clear. You’ll see improvements across all your pages. For example, the list of users in your team will show their gravatars, if they have one set, while the Account and Billing page will give you a clear display of the important information on the credit card you have on file and will clearly display if your card has expired. A very common request was to make it easier to see your past payments. We send out e-mails with this information every month, but it’s handy to be able to look it up, especially if an e-mail ended up in the spam folder by mistake. 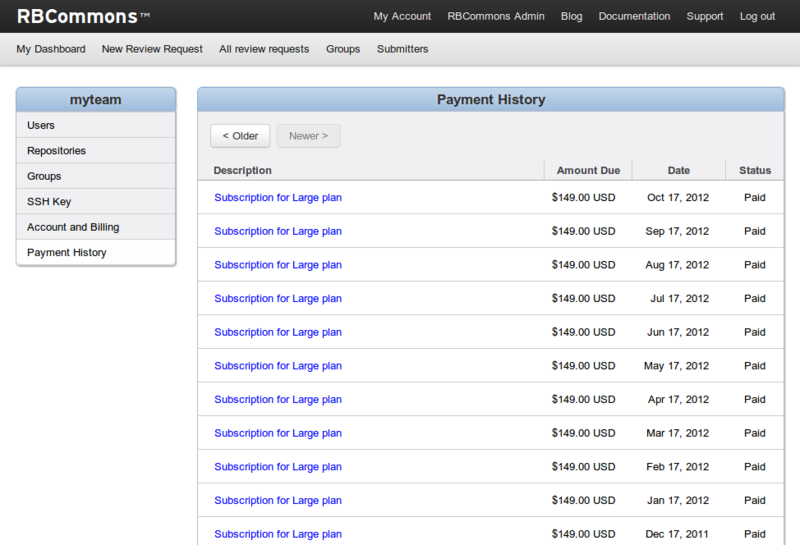 You’ll now find a handy “Payment History” page showing every month’s payment you’ve made since signing up for RBCommons. 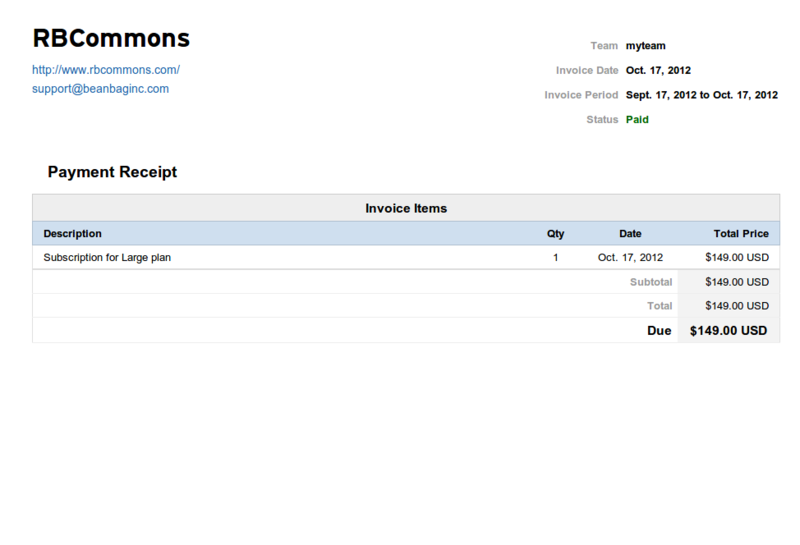 Clicking on the link for the month will show you the invoice for that payment. There’s still some work to do here. We’ll be rolling out coupon/discount information in your invoices soon, for those who have had coupons applied to their accounts. We used to have a section on the Team Administration page showing you roughly what was needed for an RBTools (post-review) .reviewboardrc file. It was per-team, though, and not per-repository. We’ve fixed that. Go to your Repositories page, and you’ll see an “RBTools Configuration” button next to each repository with exactly what information is needed to set it up with post-review. We have a few more changes that will be trickling in over the next month to make it easier to create new groups, invite users, and generally get set up. 2012 End of Year Sale! We’ve had a pretty good year, and to celebrate, we’re throwing a sale! Through the end of the year, if you sign up for a new Small, Medium, or Large plan, you will receive 50% off the price for 3 months. If you’ve signed up for a new plan in the past month, we’ll give you the new sale price. If you’re already a member and want to upgrade, we’ll give you the discounted price for your upgrade. There’s never been a better time to give us a try, so take a look at what we have to offer and sign up today!